Embroidery: I can do simple hand embroidery, but this is far from simple. However, I do have an embroidery machine. My plan was to search the web for a small rose & rosebud design that I could manipulate to get the effect I wanted. The biggest hurdle is that much machine embroidery looks very modern, so I will have to choose carefully. Luckily, before I really started the search, I ran across the new Martha Pullen book and embroidery CD’s from the DAR Museum. The book contains several waistcoats from this period, complete with digitized embroidery patterns! This is as close as it gets to replicating period embroidery by machine. I’ll use the machine to do the bulk of the work, then accent with hand-stitched details and silver spangles. The original suit has small circles embroidered around the buttons and edges, and I will probably use spangles instead of embroidery. The inspiration suit doesn’t actually have any silver on it, and I want a bit of glitz. 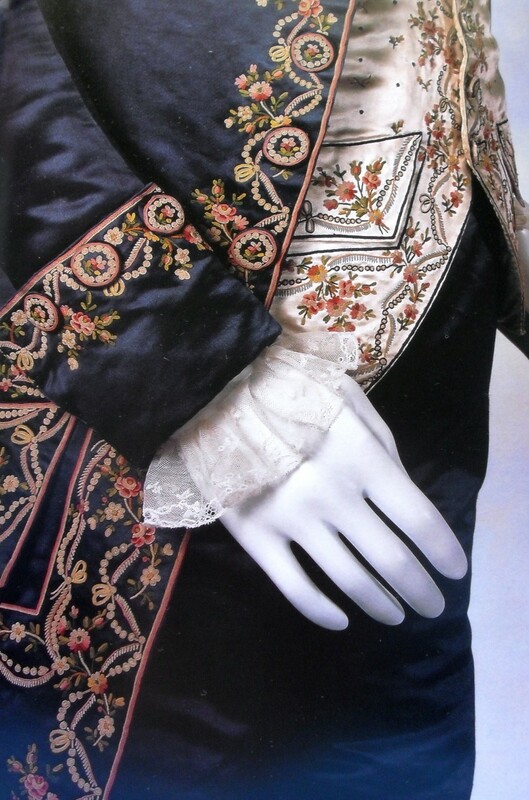 Other period suits have similar motifs worked in silver instead of thread, and I like the effect.